Thierry Bollore: "We will be ready for eyes-off driving no later than 2020, but the commercial launch depends on legislation." 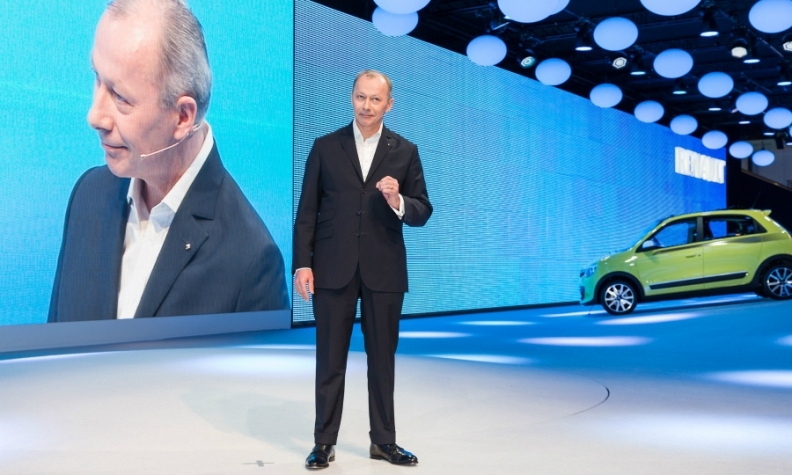 Thierry Bollore's mandate is to make sure Renault remains competitive as it seeks to recoup its multibillion-euro investment in EVs, develops next-generation connectivity and autonomous driving solutions and copes with tougher emissions regulations. Bollore outlined how Renault is tackling these challenges during a recent interview with Automotive News Europe Correspondent Bruce Gain. The cost of batteries is decreasing and demand for batteries is increasing. When do you expect Renault to start selling 100,000 electric vehicles a year and what effect will that have on the company? The threshold of 100,000 units is significant. With internal combustion engine cars, when sales total 100,000 units, you begin to benefit from economies of scale. For battery production, this 100,000 unit threshold is also important for the economies of scale. We must reach that milestone as soon as possible. It is just a matter of a few years before we do that. So whether production is 100,000 units or 300,000 units a year, we will be ready. Battery development is seen as a key factor in the long-term success of EVs. What kind of developments will we see? Driving range and charging are the two most important metrics. The weight of the battery is also a factor as is the cost. The speed at which the industry is moving when it comes to the development of batteries is exciting. For us, it is important to have a partner for battery development. For Renault, that will continue to be LG and other suppliers. MAIN CHALLENGES: Ensuring that Renault remains competitive as it faces new regulatory and technology challenges. Do you expect to achieve annual sales of 100,000 with plug-in hybrids or EVs? The market is still limited for plug-ins and EVs. We believe that plug-ins are a viable option. With our Eolab plug-in hybrid concept, our fuel consumption target was 2 liters per 100 kilometers. We achieved 1 liter per 100 kilometers. Will plug-in hybrid sales grow faster than EVs in Europe? Plug-ins and EVs could grow in parallel. It all depends on the geographical regions and what customers expect. Our EVs have a range of about 200 kilometers on a charge. But in some regions, access to charging stations is limited. In those cases, customers may prefer a plug-in hybrid. But nobody knows for sure which direction demand is headed. It makes sense to have a wide array of offerings and to make all technologies accessible. What is the advantage of offering both alternatives? The cost will go down because the battery modules are the same in both types of cars. Our strategy is to be ready for both, because both vehicles help each other. What are Renault's plans for autonomous driving by 2020? We will be ready for eyes-off driving no later than 2020, but the commercial launch depends on legislation. The connectivity solutions we will offer for eyes-off and hands-off driving will be nothing like what we offer today in the way of infotainment. We will offer wireless software [over-the-air] updates for our cars, for example. Models with our next-generation connectivity options will appear in 2018. They will be for a new-generation B-segment [subcompact] model. This system will enable your car to recognize you in a transparent way. The car will also be able to communicate with its surroundings, such as with traffic signals, other cars, etc., for hands-off driving. This is the dimension automakers are developing that is critical for autonomous driving to work. What are Renault's plans for its diesels as the powertrain faces more scrutiny from regulators following Volkswagen Group’s emissions-cheating scandal? We will focus on meeting regulations and developing what regulators mandate. There are many NGOs [non-government organizations] and they will continue doing their tests. What is important is what the regulators decide. We are not in a position to do something different from what the legislators or regulators demand. We have no intention to do more, but we have every intention to do everything that is required by legislators.